Once the facility begins commercial operation in May, it will be the first waste-to-energy project at an Estre landfill, one of the largest municipal solid waste operations in Latin America. Under the scope of the project, GE will provide three 1.4-megawatt (MW) ecomagination qualified J420 Jenbacher gas engines for an estimated total output of 4.2 MW, with the potential to be expanded to 10 MW in the next five years. The current configuration may produce enough energy to support about 13,000 average Brazilian homes. GE's fuel-flexible gas engines are powered by landfill gas, which is created from solid waste decompositiong and then recovered as a valuable renewable fuel. "This project will support São Paulo and Brazil's goals to increase the production of renewable and alternative, distributed power within the state and country. GE's solution provides us with a cost-effective, cleaner way to produce energy," said Alexandre Alvim, director, waste-to-energy and business development, Estre Ambiental. GE's Jenbacher landfill gas engines use the gas---consisting of methane, carbon dioxide (CO2) and nitrogen created during the decomposition of organic substances in a landfill. Methane has a global warming factor 21 times greater than CO2, the most widely recognized greenhouse gas affecting climate change. The new Estre Ambiental landfill project supports the initiatives of the Brazilian government to increase the production of electricity from renewable sources and may reduce the country's greenhouse gas emissions by between 36.1 and 38.9 percent from projected amounts in 2020. It may reduce the equivalent of about 70,000 tons of CO2emissions into the atmosphere. "GE's alternative gas-to-power portfolio is designed to accommodate the use of alternative fuels, such as landfill gas, while offering high levels of electrical efficiency," said Juan Galan, general manager, Brazil---GE's Distributed Power business. "Our Jenbacher gas engines are quick to install, easy to relocate, more reliable and fuel-flexible to best meet the energy, environmental and economic needs of our customers, such as those in Brazil and throughout Latin America." 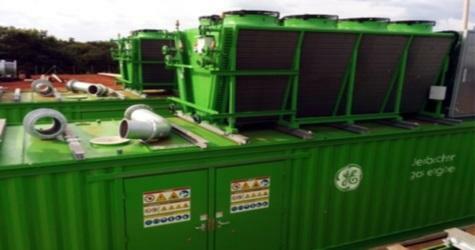 GE's Jenbacher units are part of GE's ecomagination portfolio. To qualify for the portfolio, products and services must demonstrate both improved economic value and environmental performance. Ecomagination is GE's commitment to provide innovative solutions that maximize resources, drive efficiencies and make the world work better. The announcement comes just days after GE launched its Distributed Power business in Latin America on April 8, 2014, in Mexico City. The business is focused on power generation at or near the point of use, including a potential $1.4 billion investment in technology to develop new and improved products for customers. The new Distributed Power product portfolio includes GE's aeroderivative gas turbines and Jenbacher and Waukesha gas engines, which generate 100 kilowatts to 100 MW of power for numerous industries globally. Headquartered in Cincinnati, Ohio, Distributed Power employs about 5,000 people around the world. GE Power & Water provides customers with a broad array of power generation, energy delivery and water process technologies to solve their challenges locally. Power & Water works in all areas of the energy industry including renewable resources such as wind and solar, biogas and alternative fuels; and coal, oil, natural gas and nuclear energy. The business also develops advanced technologies to help solve the world's most complex challenges related to water availability and quality. Power & Water's six business units include Distributed Power, Nuclear Energy, Power Generation Products, Power Generation Services, Renewable Energy and Water & Process Technologies. Headquartered in Schenectady, N.Y., Power & Water is GE's largest industrial business.